That quick breakfast you grab on the way to work now comes Lisa Frank-themed. 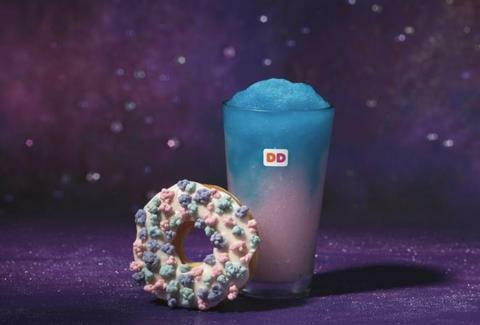 Dunkin' Donuts just released a new set "cosmic" treats that might remind you of Starbucks' Unicorn Frappuccino. It's supposed to be space-themed but it looks a little unicorn-y. The donut hub has announced two new Coolatta flavors that look like the Eagle Nebula if the Eagle Nebula was a frozen sugary drink served in a donut shop. Gird your taste buds, because the cotton candy-flavored Coolatta joins the worlds of cotton candy and blue raspberry, while the Cosmic Pineapple Coolatta joins pineapple and blue raspberry flavors in holy matrimony. It's every bit as intense as that time Bruce Willis landed a spaceship on moving asteroid. To make sure you can taste the cosmos (Neil deGrasse Tyson not included), Dunkin' is offering all Coolatta flavors for just $2 through May 27. You can get your hands on the Coolattas and the donuts right now at participating Dunkin' locations, just in time for the Eta Aquarid meteor shower.